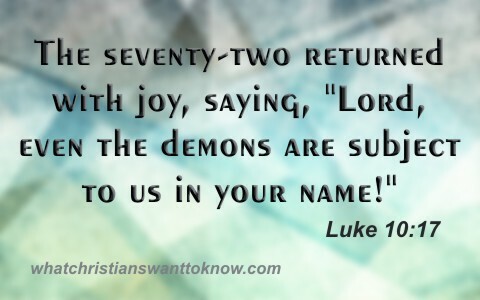 Here are my top 7 Bible verses about casting out demons, sometimes referred to as devils. Interestingly, the first ones to acknowledge that Jesus was God were the demons which is why Jesus didn’t permit them to speak because they often declared “You are the Son of God!” (Luke 4:41) to which Jesus would silence them. By doing so, Jesus shows that He has all authority over the demons including the Devil. Jesus once conquered the Devil’s three-fold temptations during the temptation of Christ in the wilderness (Matt 4:1-11) proving that Jesus has authority over all the demons and even Satan himself. This also shows that the demons, who are fallen angels, beheld the glory of Jesus Christ before He came to this earth for His earthly ministry and so they knew Him before He entered human flesh and very possibly before there were even humans created. This is what the disciples whom Jesus had sent out said when they returned. He gave them the authority to cast out demons. They didn’t necessarily have that authority of themselves because no human is a match for a demon but when Jesus gives you the authority, then you have His authority. I would imagine these itinerant Jews were surprised. They had apparently been seeing or hearing of Jesus casting out demons and maybe some of His disciples had been doing the same thing so they wanted to try it. They got part of it right; they used Jesus’ name but apparently they were not known by Jesus because the possessed man beat them all and they ran out of the house naked and bleeding, showing you don’t really want to fool around with demons if you are not a child of God and thus, don’t have Jesus’ authority. This was not just one demon but a whole legion of demons and a Roman legion during Jesus’ day could have been anywhere from between 3,000 and 6,000 troops. This could not have been done by any single individual. It took God Himself to cast out so many demons because of the tremendous power that they had collectively. This casting out of demons was even more impressive because the man was so possessed by demons that “he was kept under guard and bound with chains and shackles, but he would break the bonds and be driven by the demon into the desert” (Luke 8:29). Apparently, Jesus didn’t waste much time casting out demons for from the very beginning of His earthly ministry, he was casting out numerous demons in at least twenty different circumstances that we know about in the New Testament. We see this verse as being part of the same ministry; preaching in the synagogues and casting out demons. This is clear evidence that Jesus gave the disciples the authority to cast out demons meaning that by themselves, they had no such authority. Remember what happened to the Jews who were trying to cast out demons in their own authority? They were beaten badly and ran for their lives. Jesus gives the authority. It is not something that we take up for ourselves as many try to claim. The final verse about casting out demons was again when Jesus was confronted by demons and they already knew Who Jesus was which is why they once “cried out, “What have you to do with us, O Son of God? Have you come here to torment us before the time” (Matt 8:29) showing that they know that they are headed for torment someday as it says in Revelation 20:9 where they will be “thrown into the lake of fire and sulfur where the beast and the false prophet were, and they will be tormented day and night forever and ever.” They didn’t want that to come “before the time” indicating that the Devil and the demons know their time is coming and they seem to know when that time will be. I was reading about St Paul who had trouble with the sins of the flesh, but he was suffering from a different kind of sin. God made satan tempt him to stop Him from being proud and hawty. St Paul said it was like a thorn in his flesh all the time, which I thought he had sins of the flesh where I was mistaken. Then I went on to read End Of Days which I found very scary and I could not understand a lot of it. I know I am being tempted by something a demon? which is like a battle in my head against that sin I have. I hate it, but I can`t stop it. Like St Paul I was smug that`s the word I used but I was brought down to Earth with that sin and it`s really getting on my nerves. Can you shed some light on this for me Jack. Give the first part of your day to God. Reading His word, praying for help, guidance, and protection. Be thankful for what He has done for you. In this way you are applying the armor of God upon you. Also, be very aware of what you allow in your home (T.V., radio, social media, etc.). Play only encouraging things that praise God and are instructive. If you try this you will see in a very short time your whole life will change into something that can only be described as miraculous! Something so amazingly beautiful that you will ponder how you could have ever lived any other way. We are here to be remade into the people God created us to be. I agree with you God keep you. If it is only in your head..you need not be concered..as greater within. There is only one comandment which cannot be forgiven. Find that comandment..write it out..
And understand that which is making you..lives in you..
And that is my fathers spirit. Know then who you are. If a child asks me. Where is god. Its so easy to tell them…god is within you.. If one of the practices..of old testimine..or that which places god afar..and they believe this. Then they must..lead afar..to then return to within. For they seek father..through the labarith of the things if satan..and then only the worthy become his sons and daughters. But yes. Father is within..i am there always. Tell the child that God is Holy and sits in His heavenly throne, with Jesus Christ seated at His Right Hand in glory and He directs the living church and desires all men repent and trust in Him. The Holy Spirit is only in those who are the children of God. But to add..unless you take it away yourself..
Or are directed to from. Zion. And too who will know his voice. Do you tell me..to teach..or do you ask..
For if a child asks me..i will tell you.. So if then the man comes in and eats supper with you…and you know his voice..then to you understand..
Who sends..and the sender is from zion..which is the heavenly kingdom..
And untill you sit at that table.. I tell you nothing my friend. Let the Scripture speak for itself. Thank you for you mysterious comment. Not sure what you mean. Next post: Why Was There Polygamy In The Old Testament?